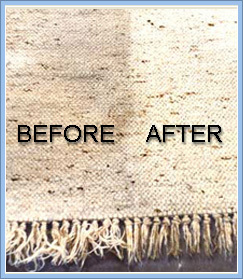 Special types of rugs require special cleaning care. Keeping care tags on the rug or in a file can save you from costly mistakes. Follow these tips for taking care of specialty rugs. Woven or braided rugs: Check rugs for stitching breaks before and after cleaning. Check labels to determine whether small braided rugs are washable. If they are, place them in a zippered pillowcase or mesh laundry bag. Wash in cool water on a gentle cycle, rinsing thoroughly. Tumble dry on a low setting. Place large braided rugs on a vinyl or concrete floor or place an old blanket beneath them. Sponge commercial carpet-cleaning foam over the surface and rub it in according to the product directions. Finish by rinsing or vacuuming. Dry thoroughly before replacing the rug on the floor. Handmade, hand-knotted, antique, and Oriental rugs: Vacuum a new Oriental rug as you would carpet and wool area rugs. Use special care with delicate vintage or antique rugs. Protect them from the vacuum by placing a piece of nylon screen over the rug and weighting it down with books or bricks. Vacuum over the screen. Or, tie a piece of nylon mesh over the vacuum attachment and change the mesh frequently as dirt accumulates. Have these rugs professionally cleaned once a year. Rotate rugs to ensure even wear; direct exposure to sun will cause fading. Note: When buying antique rugs, learn as much as you can from the seller about the rug's fiber content and construction. Ask for care tips. Coir, sisal, rush, and grass rugs: Rugs made from these natural fibers feature an open weave that allows dirt to sift through to the floor beneath. Vacuum frequently, removing the rug occasionally to vacuum the floor, as well. Many of these rugs are reversible; if so, flip every time you vacuum for even wear. To clean stains or discolorations on a room-size natural-fiber rug, leave it in place. Protect the floor beneath it with a plastic drop cloth and towel. Scrub the stains with a soft brush dipped in soapy water. Rinse with clear water. Place a towel over the wet area. Blot the cleaned spot as dry as possible. Use a portable fan or hair dryer to speed drying. Move small rugs to a protected table or counter to clean. Water weakens the fibers, so work quickly and dry thoroughly to extend the life of these rugs.Some natural-fiber rugs are constructed in squares that are sewn together. Buy a few extra squares or a smaller size of the same rug. If a rug square becomes irrevocably stained, clip the threads that hold it in place and replace with a new square. Hand-stitch it in place with heavy-duty carpet thread. Fur, sheepskin, and hair-on hides: Shake unscented talcum powder on fur, sheepskin, and hair-on hide rugs and leave for several hours. Brush the talcum powder through the hair, then shake it out. Repeat this process several times, depending on the length of the fur.To clean the back of such a rug, use a clean cotton cloth dipped in lukewarm soapy water. Wipe off any dirt or spills. Rinse with a cloth dipped in clean water and allow to dry completely before putting back in place.